My Chef strikes again! And each time I seem to be surprised all over again! Sorry honey that doesn’t mean anything I’m just never bored with what he comes up with! 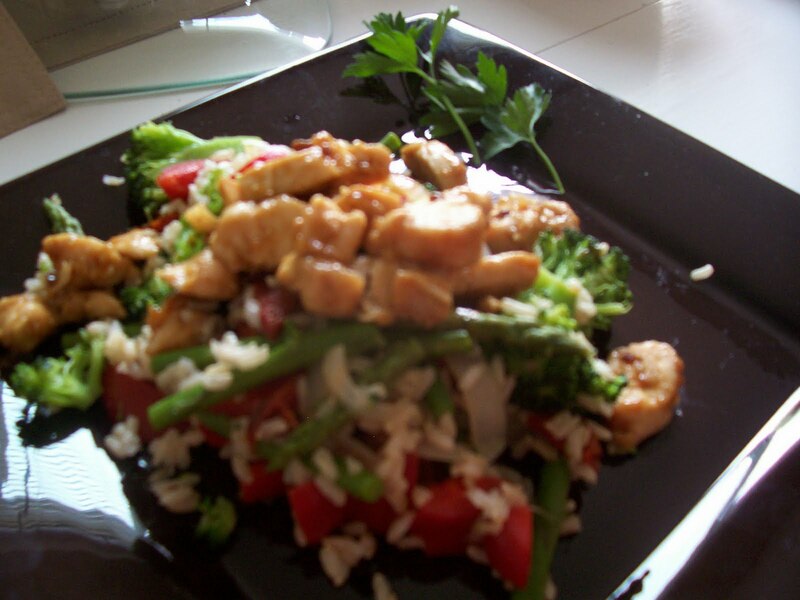 This time he threw together a sort of stir fry that turned into an asian deluctible dish! He made a peanut sauce people! All on his own too! Is that amazing or am I just awestruck?! This meal was so good because I have been missing my Vietnamese/Thai cuisine! I guess it hit the spot! It was chicken on top of broccoli, asparagus, rice, mushroooms, peppers, onions! MMMmmmmm! My mouth is watering again just thinking about it! I am pretty sure that I am luckiest woman in the world. What is better than good food and goood luuvv!? Anna I just found your blog!!! Didn’t know it excisted!!! i love to hear all the great things he makes there really interesting and it gives me good ideas but what else do you guys do besides eat???!! hahaha! I wanna know! !